Storyist is the perfect tool for writing on the go. Great ideas don't always come to you when it's convenient. Sometimes you have to go out of your way to capture those moments of brilliance, and Storyist makes it easy to do just that. Grab Storyist, a word processor that is easy to use on desktop or mobile, on sale now for just $19 (approx. £14)! Storyist is a do-it-all writing platform that isn't limited by what operating system you use it on. Whether you're sitting at your desk or in a seat on the bus, you can pull up Storyist and get to work on whatever has sparked your creativity. 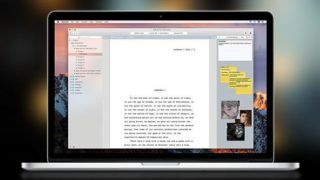 It's a fully-featured word processor that comes complete with templates to help you put together your writing process, whether you're crafting a novel, screenplay, or just typing out some notes that you want to remember. You can get Storyist on sale right now for just $19 (approx. £14). That's a saving of 67% off the retail price for an app that will help you bring your writing to life no matter where you are, so grab this deal today!